The handmade Amish Poly Classic Swivel Dining Chair features wonderful traditional outdoor furniture styling with a great swivel function. The swivel function allows for 360 degrees of easy reach, entry, and exit for whoever takes a seat in this comfortable poly chair. 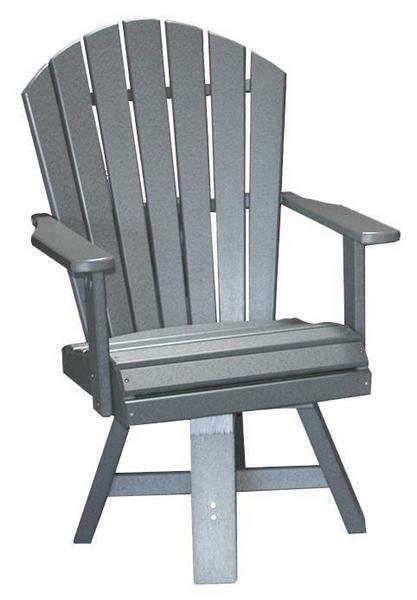 Two arm rests are featured as well to provide even more comfort. This outdoor dining chair is made with sustainable and strong poly lumber, a material long prized for it's durability and benefits to the environment. Choose from our wide range of poly colors and two-tone colors to create your own unique look or to simply match the rest of your outdoor decor. This chair even ships fully assembled!